So where would I get such an outlandish idea, anyway? When I was growing up, long before tea bags were available for purchase at the grocery store, Lipton brand tea came loose in a box. These days, I buy my teabags, but back then my grandmother would make small cotton bags with a tablespoon of tea sewn up in them for medicinal use. When we were cut or bruised, she would pour boiling water over it to moisten the bag. As soon as it was cool enough to touch without burning fingers, it was placed directly on the cut or bruise. More than once, I had a hot teabag tied to my foot after I stepped on a nail. When the tea bag was dry, most of the pain was too. (Please see a doctor if your tetanus shots are not current!) The tannin in the tea seems to dissolve the pain. For minor burns, she first soaked the tea bag in boiling water for a few minutes, then added ice cold water. A soft cloth was dipped into the tea, then carefully draped over the burn if it was too large to soak in a bowl or small tub of tea. Most of the time, pain went away, and the burn healed without blistering. When my kids were small, I kept a spray bottle full of strong tea in the refrigerator and spritzed them with it when they were sunburned to ease the pain. Now that I am grown and have done some reading, I realize that it is the tannin in the tea that has such great healing properties, but as a child, I thought my grandmother had a magic healing touch. to put a tea bag on it!" Several years ago, on a blistering hot summer day, I wore the wrong sandals to campus for classes. They were just large enough that they slipped around on my feet and blistered the tops of all my toes. It hurt to wear them, so I took them off and went barefooted on concrete sidewalks–not a good idea on a day when the mercury hits 107 degrees F in the shade. By the time I got home that night, both the tops and bottoms of my feet were covered in blisters. I could barely walk well enough to get from the car to the front door. I asked my husband to make a gallon of strong black pekoe tea. He put it in a foot tub with five trays of ice so I could soak my feet. 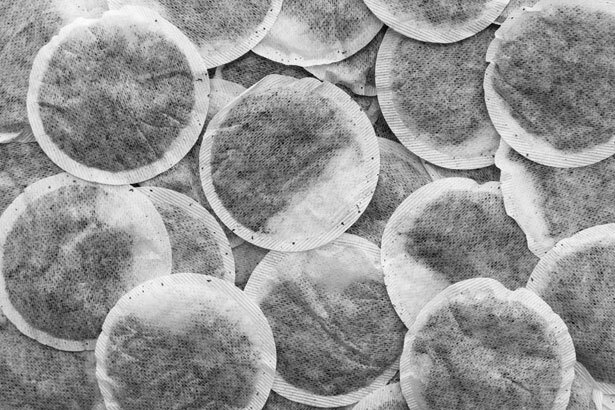 I kept them in the tea for two full hours, then slipped on a pair of clean, thick cotton socks and went to bed. The next morning, my feet no longer had any blisters and did not hurt. In November 2008, I burned my hand. I usually use a cast iron skillet to bake cornbread, but for some reason that day I used my stainless steel skillet–the one that has a cool touch stainless steel handle (at least it stays cool on TOP of the stove). The pot holder slipped in my hand, so I set the pan on the counter to keep from dropping it, then forgetting that stay cool handles are not cool when they come from a 420 degree F oven, I picked it up with my bare hand. a 420 degree F oven. All four fingers, my palm and my thumb instantly blistered up. I had some tea made and filled a medium size bowl half full and added ice. After soaking my hand for an hour in the tea, the blisters were almost gone and the pain was completely gone. The next morning, I had one blister about a half an inch long on the palm side of my ring finger. All the others were gone. A cup of hot tea with a tablespoon of honey and a teaspoon of lemon juice is soothing to my sore throat when I am ill. Herbal teas are also good for this. Celestial Seasonings has a wonderful tea called Raspberry Zinger that is soothing for a sore throat, and has enough vitamin C that we use it to help get over colds or flu. 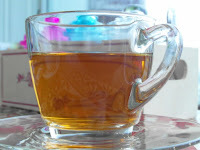 Chamomile tea is soothing to jangled nerves and is helpful for rashes, too. I use it as a tea and when I have hives or poison ivy I use it as a wash to ease the irritation. There are dozens of traditional uses for teas of all kinds. As long as tea gives these kinds of results, I will continue to buy tea both for drinking and for medicinal purposes. Please Note: I am not a doctor. I am not prescribing or recommending that anyone use these methods medicinally. I am simply relating what my family has used effectively. See your doctor for any health issues you may have. You are responsible for any use you make of these methods. Have you used tea medicinally? I have heard of using moist tea bags to sooth irritated eyes, too. I've used it for that, too. Thank you for commenting!